Summer is my favourite season! It’s time to have fun, relax and travel. And that’s when usually the brightest and funkiest nail polish collections start arriving. The new Dior Care and Dare Summer 2017 nail polish collection delivers exactly that. It includes two stunning shimmers, Optic White and Blazing Bronze, and a classic but powerful vibrant creme, Coral Crush. These limited edition colours are distinctively different, yet work really well together. Each colour defines summer in a different way, making me recall white sea foam, tan and juicy mocktails by the beach. Re: swatches below, the polishes are shown in direct sunlight and in the shade. 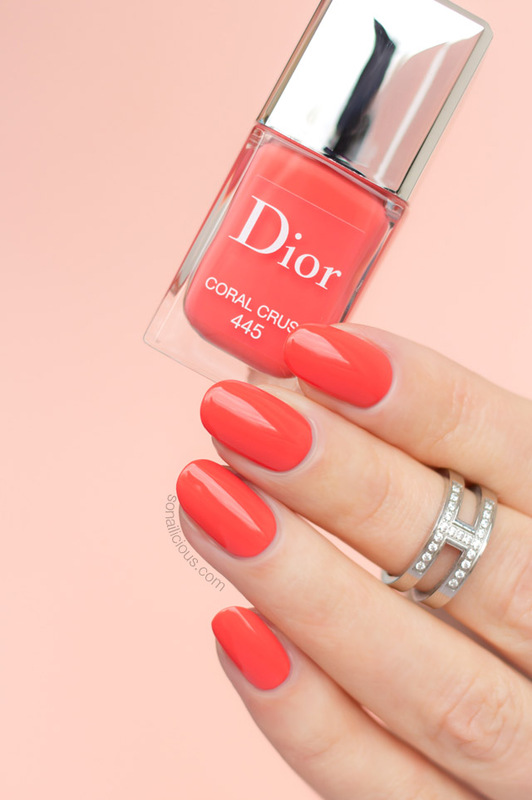 Coral Crush – a strong warm coral nail polish with a pastel vibe. Blazing Bronze – a milky chocolate brown polish with a strong bronze shimmer effect. 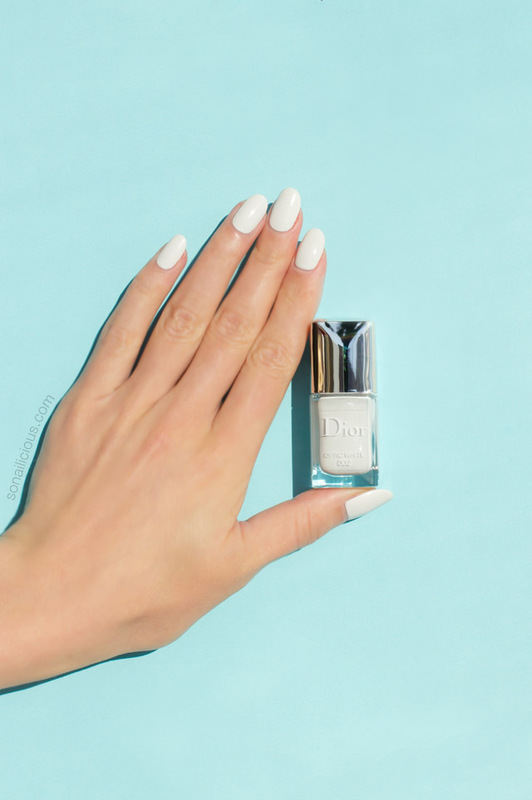 Optic White – a bright white nail polish with cool undertones and a delicate silver shimmer effect. 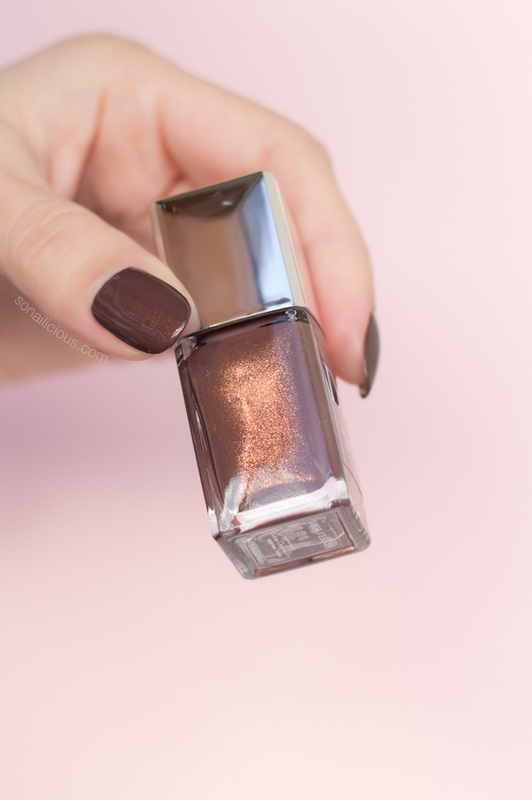 Both, Blazing Bronze and Optic White feature a much stronger shimmer effect then the signature Dior subtle semi-shimmer that is present in almost all Dior lacquers. 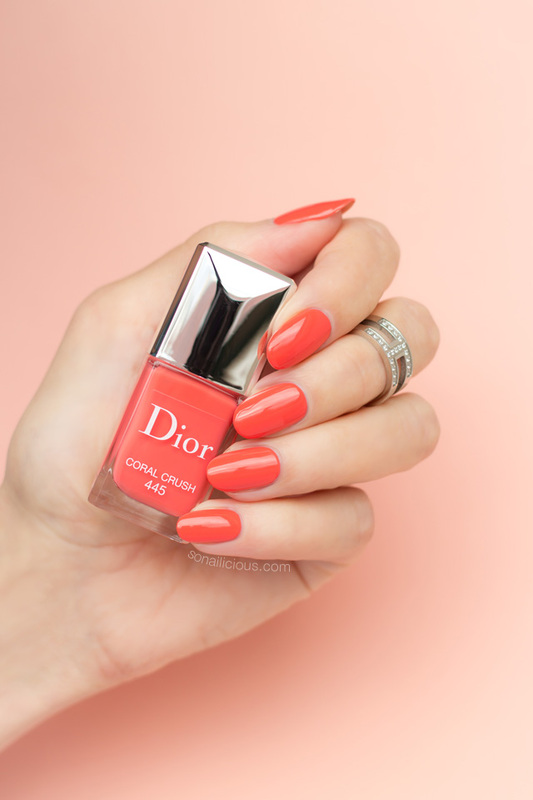 On another hand, Dior Coral Crush is a solid creme colour relying on its vivid brightness to stand apart, without any shimmer at all. Formula: 5-free, fast drying and long-lasting. 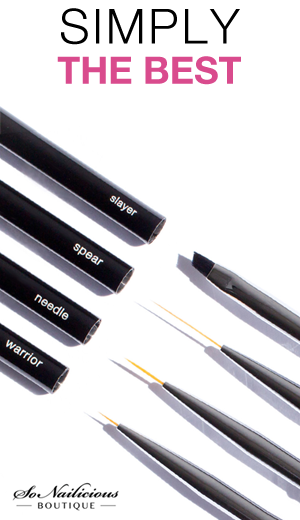 The formula is highly pigmented. You’ll only need 2 thin coats to get full coverage with Blazing Bronze and Coral Crush, pictures – 2 thin coats with 1 layer of a top coat. 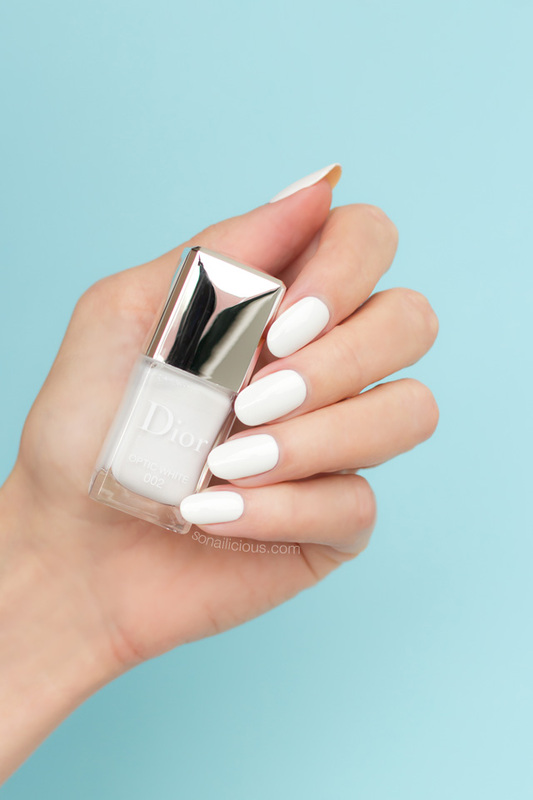 Dior Optic White, however, requires 3-4 thin coats to get it fully opaque. 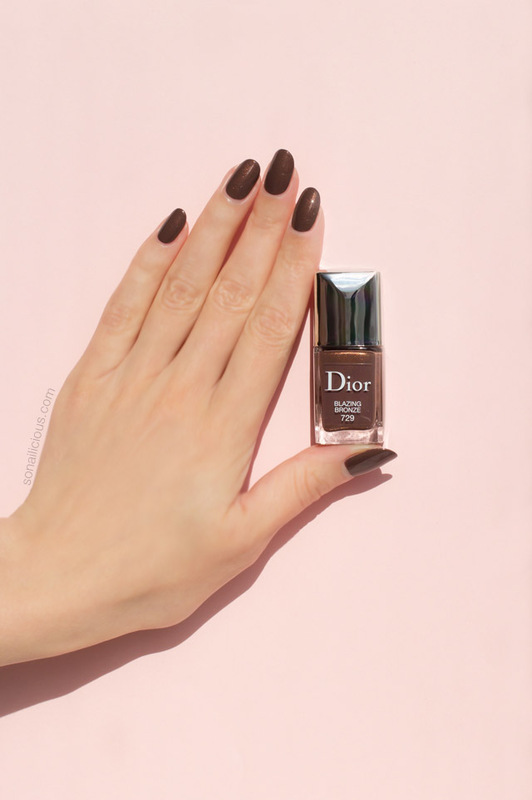 Application: The new Dior Care and Dare polishes are a dream to apply – flawless formula and extra-wide soft brush with rounded ends makes it very easy to get a perfect looking manicure. 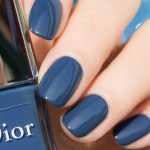 For instance, all swatches were done without any clean up, it’s that ease to apply Dior lacquers without any mistakes. Wearability: Lasted for 7 days with top coat. Nail Art: the flawless formula works wonderfully for all nail art. Here’s a Festival nail design with Dior Blazing Bronze and this negative space manicure features Dior Optic White. 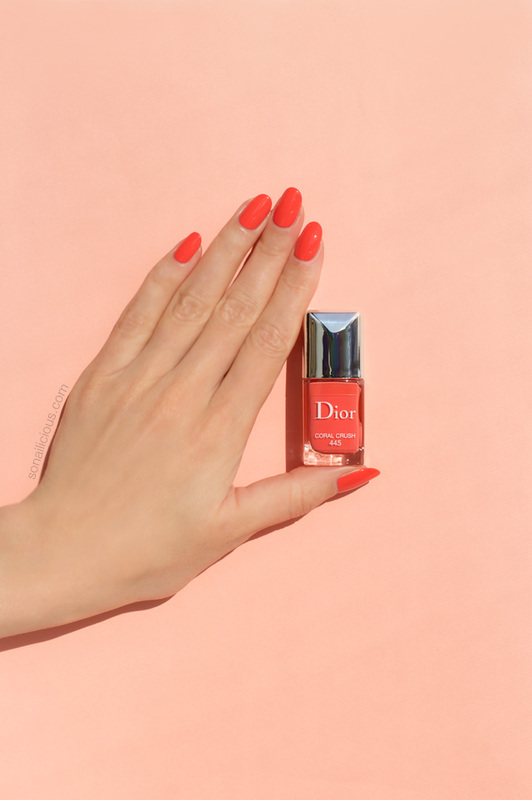 The closest colours to Dior Coral Crush are Sally Hansen Get Juiced and Dior Cosmic. However, Coral Crush is a bit warmer than these two colors and it looks much brighter on nails, almost neon like but more elegant. Also, it’s the only coral nail polish that is suits my skin tone perfectly. 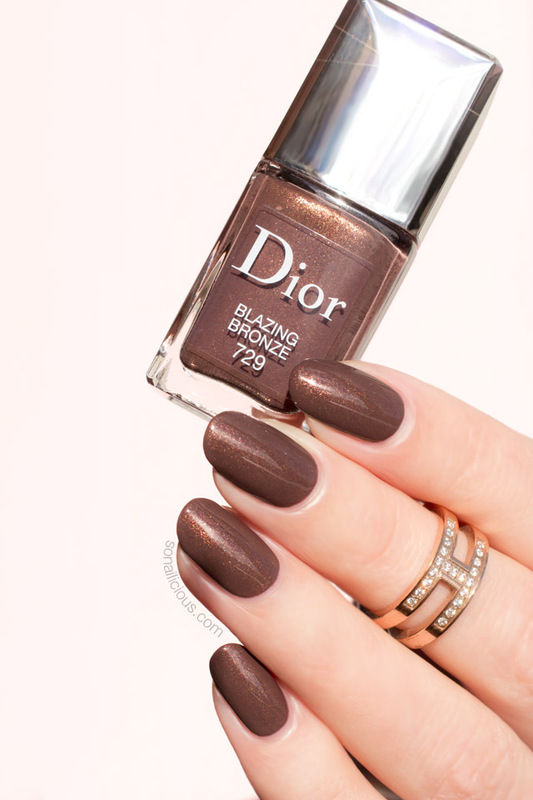 Dior Blazing Bronze seems to be fairly unique with no dupes. 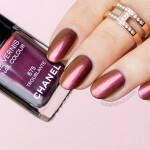 The closest colour is Chanel Cavaliere. However, Cavalier is about two tones darker and less shimmery than Blazing Bronze. The shimmer is the latter is also much brighter. 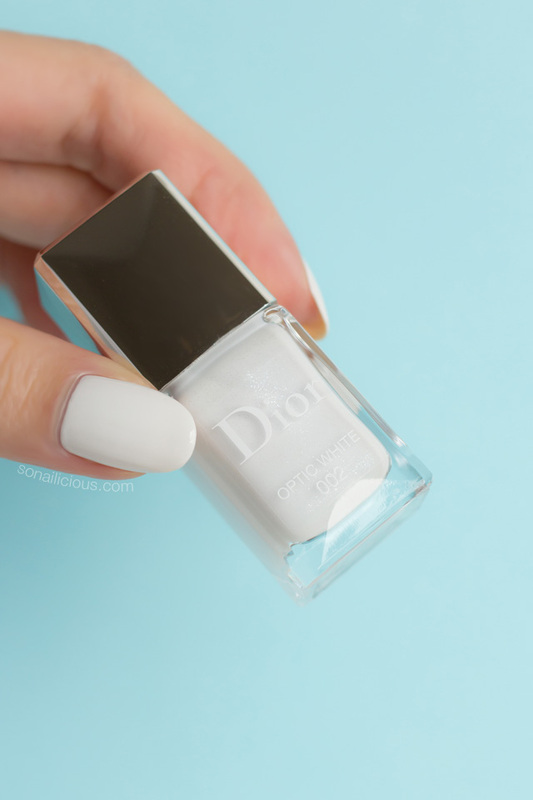 With the Optic White, there are many white polishes out there, but this white polish seems to be cooler toned in comparison to other polishes. Plus, the inclusion of silver shimmer sets Optic White apart from other whites. I’ll show polish comparison photos/videos tomorrow on Snapchat (username: SoNailicious) and on Twitter – so if you’d like to see dupes, find me on Snapchat or Twitter. 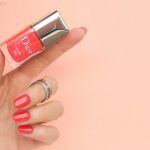 Overall Impression: The new Dior Care and Dare polishes are stunning and as always, the formula is flawless. The colours compliment each other well, but easily stand strong alone, if you only want to splurge on one! 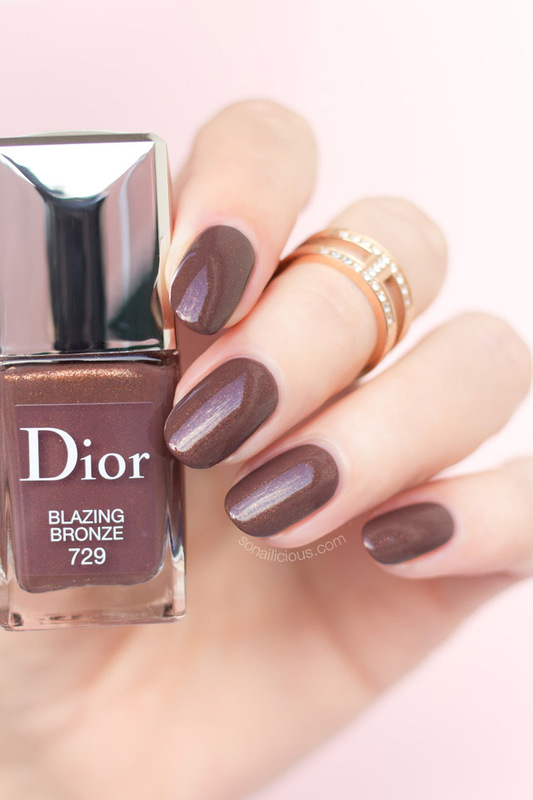 Blazing Bronze is definitely a polish worth investing in. 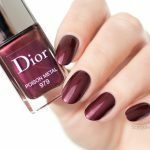 Even if you don’t like browns, this polish will change your mind. Coral Crush looks flattering on both dark and light skin tones, even those with blue-ish, prone to redness skin (like me) will enjoy it. So if you had trouble finding your perfect coral then try Coral Crush. 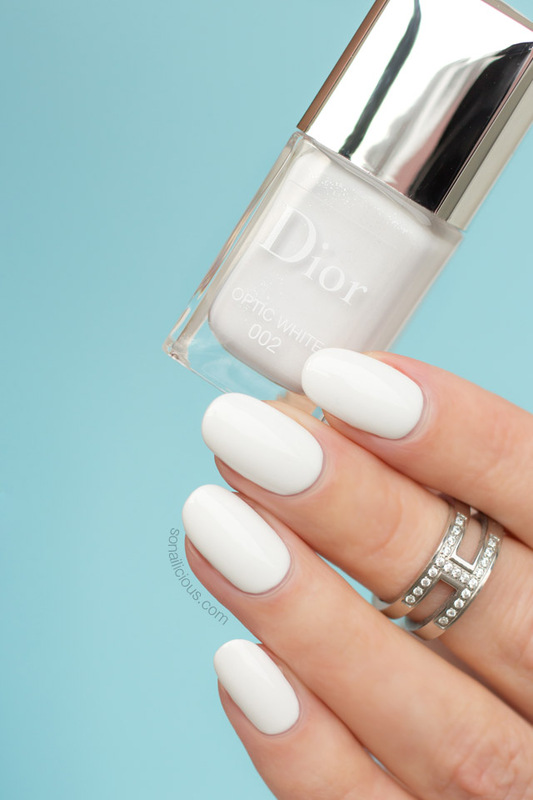 The Optic White is a very special white, so if you like light nails it’s a must! In conclusion, if you can get all three Dior Summer 2017 nail polishes! 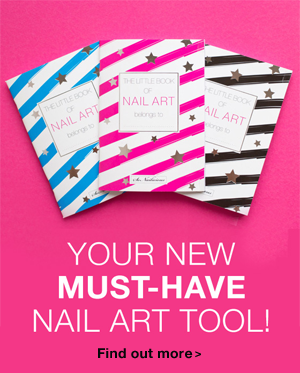 This beautiful trio has rightfully earned it’s place as one of the Top 5 Summer Nail Collections this year. Without doubt, these limited edition colours are going to sell out fast! 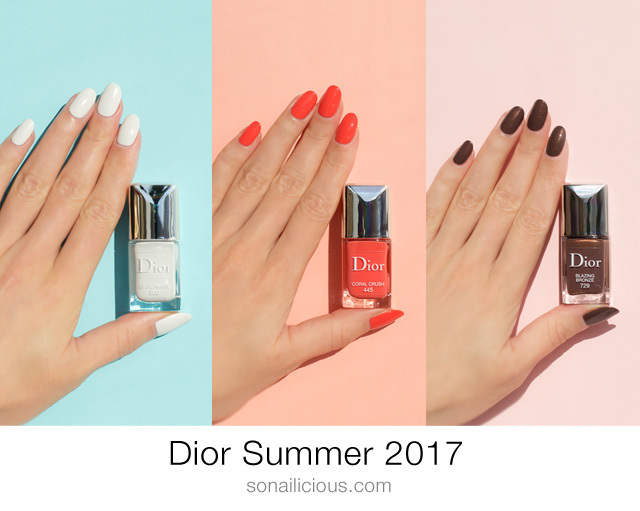 Availability: Dior Summer 2017 nail polishes are available US $27 – here, £20 – here and AUD $41.00 – here. Wearing: Platinum & Rose Gold Knuckle Rings. 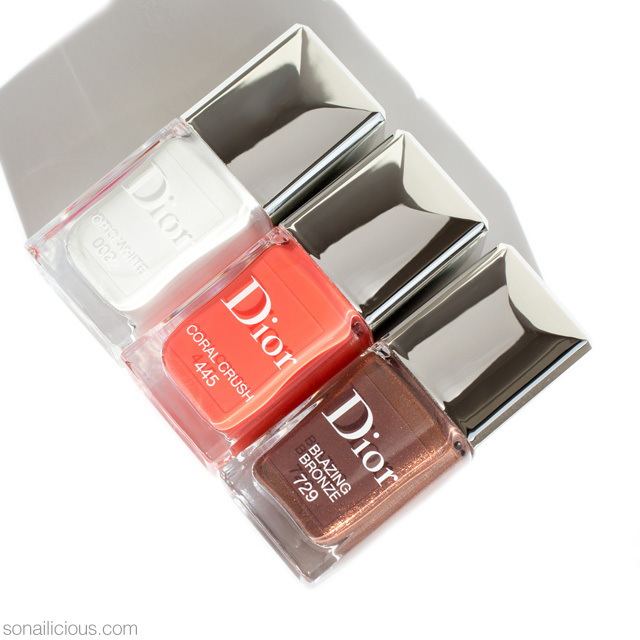 Which of these Dior polishes do you want to splurge on? Have you tried any already?